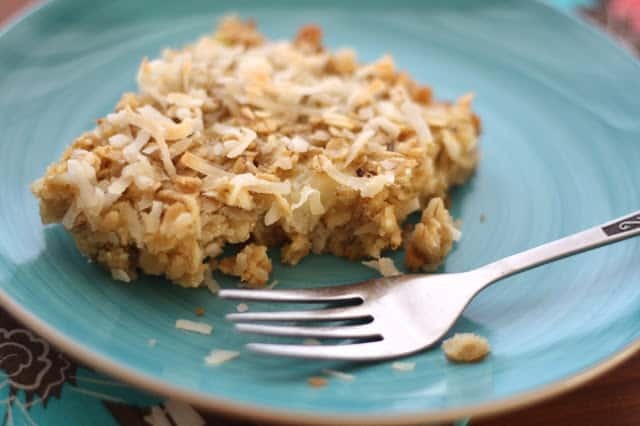 Juicy bites of pineapple, mixed with chewy oats and sweet coconut to give this baked oatmeal a fun tropical twist. When the idea for this oatmeal first popped into my mind, I wasn’t sure it would work. I decided to give it a try though and I’m so glad that I did! My boys went crazy over this breakfast last week and begged for it again just a couple days later. As it turned out, I liked it every bit as much as the kids did! 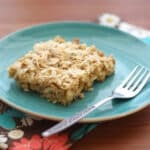 I love the convenience of making oatmeal for breakfast; whether it is baked, cooked on the stove-top or in the crock-pot. It usually takes less than five minutes to stir a batch together and then you can walk away and finish getting ready for the day while it cooks. Are you looking for more breakfast ideas? Check out all of our Best Oatmeal Recipes! Preheat the oven to 350 degrees. Combine the dry ingredients in a bowl and stir to combine. Stir in the butter, then add the milk and stir again. Add the eggs, stir to make sure they are well combined. Add the pineapple and 1/2 cup coconut. Stir and then pour into a greased 9x13 baking dish. Top with the reserved 1/4 cup coconut. 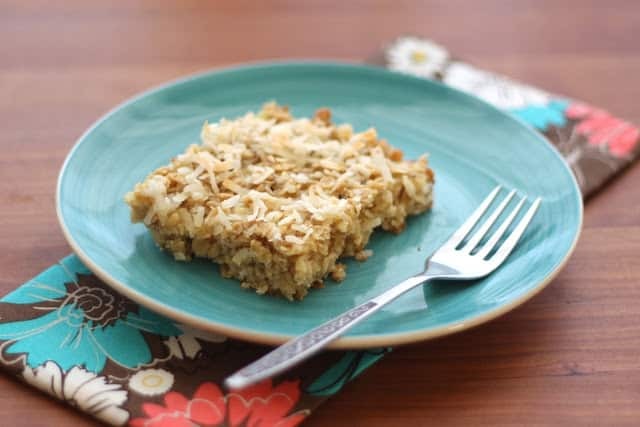 Bake for 30-32 minutes, until the edges have browned and the coconut is very lightly toasted. Remove from the oven and let cool for 5 minutes before serving. Enjoy! The leftovers will keep nicely in the fridge for up to 3 days. This is a great way to enjoy oatmeal for sure! Love the tropical twist... very summery!!! What a beautiful oatmeal recipe. I'd be happy to start my day with this. Oh yeah---dessert for breakfast, I'm in! What a great breakfast bar - and it pretty much cooks itself. Made it for our after school snack today. It's a piña colada in every bite! We love it! Has anyone tried making it in a smaller dish? This will work fine in a smaller dish. 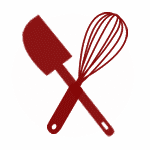 The oatmeal will simply require a slightly longer baking time and the finished oatmeal will be thicker.